The neighbors of the demolished home are relieved, saying the home was "an eyesore with broken windows." 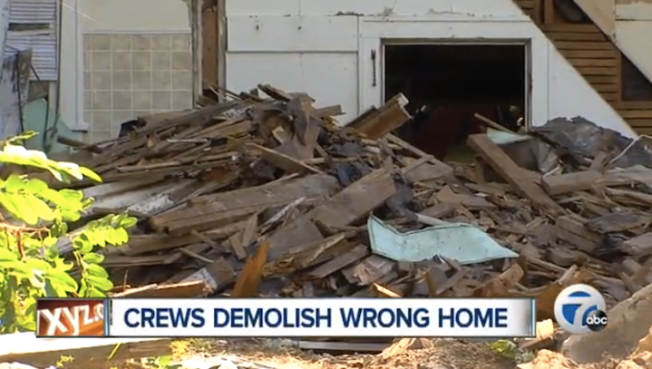 Detectives in Michigan are investigating the alleged swapping of address numbers that led to the wrong house being torn down, reports ABC 7 Action News. The homeowner of a house slated for demolition is accused of changing the address numbers with the house next door. A man only named as Mike, who owns the house that wasn't supposed to be torn down (but was) told 7 Action News he was planning on renting it out in October and hopes the city of Pontiac will buy him a new home. The neighbors of the demolished home are relieved, saying the home was "an eyesore with broken windows." Apparantly there were also squatters living in the home. "When I heard they tore down the house on accident I wanted to give them a twelve pack of beer. I was that happy," said neighbor Fred Sargent, adding that "if anybody was going to rent that out, it had to be a crackhead." Crews returned later that day to destroy the correct home. Read the full story on ABC 7 Action News.